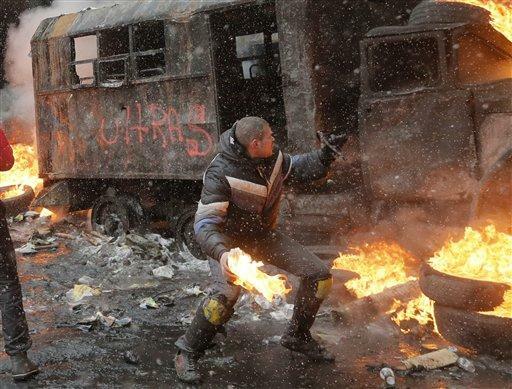 A protester throws a Molotov cocktail during clashes with police in central Kiev, Ukraine, Wednesday, Jan. 22, 2014. Then, earlier this month, the street protests turned violent after the country’s parliament passed sweeping legislation aimed at curbing the demonstrations. The government has since backed away from those laws, but an official repeal has yet to be signed. The country’s president last week proposed a power sharing deal with opposition leaders. But the protests, known as Euromaidan, continues on, and has spread to other cities, with the goal of pushing for the resignation of President Viktor Yanukovich. This week on Global Journalist, we talk about the crisis in Ukraine, and what the future holds for the country. Nicolai N. Petro is a professor of politics at the University of Rhode Island and a visiting scholar at Odessa National University in Ukraine. Kateryna Panova is a freelance photojournalist who just returned to New York after a two-week stint in Kiev earlier this month.